!! The Old Suns Picture Archive !! 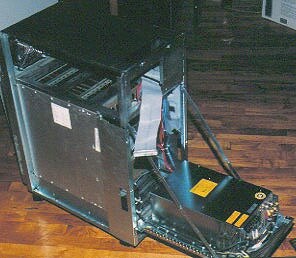 The Sun 3/160 has essentially 4 major parts - The Chassis which includes the backplane, the VME cards that are the computer, the powersupply, and the disk system. 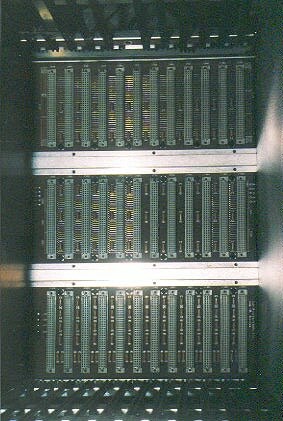 This is a shot from the back of the machine looking into the backplane and the card cage. All the VME cards plug into this backplane. As you can see, this machine has 12 card slots. 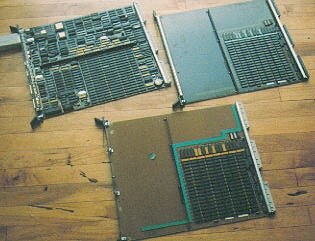 These are some of the the VME cards that are normally plugged into the backplane. The heavily populated board is the main board containing the CPU, 4 megs ram, and almost all the other stuff needed to run the computer. Except for the SCSI controller, the machine could run fine with just this card. The other two cards are memory cards, each holding 4 megs. This is a view of the powersupply from the front of the machine. 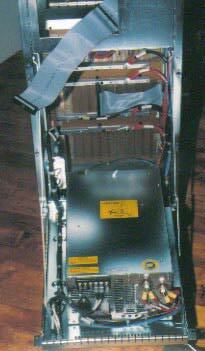 Note the opposite side of the backplane, carrying SCSI (the gray ribbon cable) out from slot 7 and up to the drive bays. 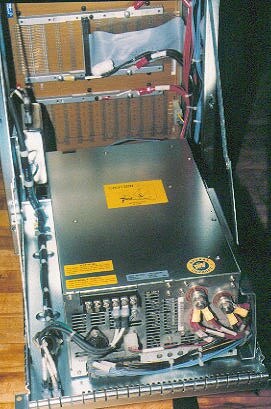 This is another view of the powersupply. Note how it swings out on folding arms. A very clever design. Also, with the drives removed, from this view you can peer down into the card cage. A close-up of the rather beefy powersupply. This machine can act as a heater in the winter. 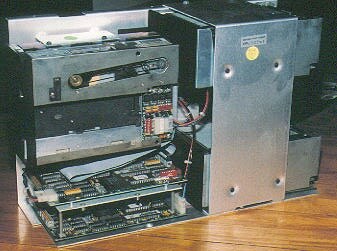 The Disk System: Here you're looking into the tape drive, with the tape drive's SCSI conversion card, and the Emulex SCSI to EDSI conversion card for the 2 300 meg EDSI drives that the system boots from. 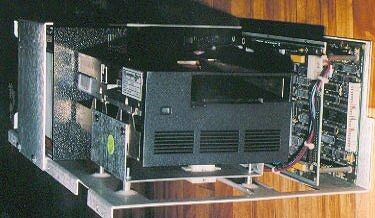 The tape drive is a Wangtek and the HD's are Micropolis. 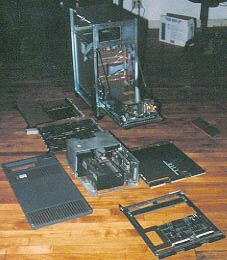 Another view of the disk system - here you can see more of the harddrives that sit behind the tape drive and the cards. My plan over the next few weeks is to remove the EDSI drives and go pure SCSI with a single 1 gig drive.